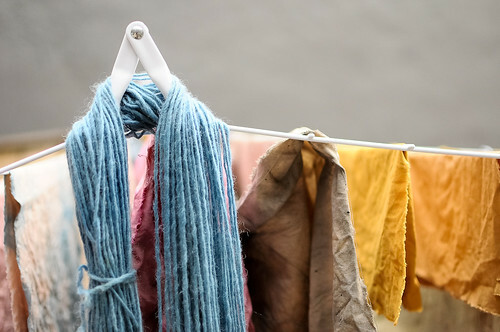 One of our many new classes is an Advanced Natural Dyeing class. 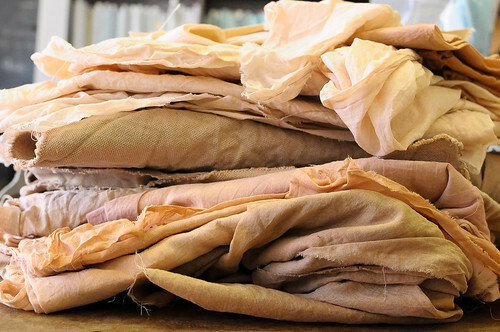 Many of the past Natural Dyeing students wanted a next level class where they could explore more dyestuffs and different techniques. Also, we just love taking classes from Julie. The advanced class is completely self directed, so each student has their own personal projects and develops a plan with Julie ahead of time. Natural dyeing is really exciting. I love when the back area and kitchen of the workroom changes into a laboratory with pots everywhere that are bubbling up with bundles of fabric inside. It’s messy and chaotic and thrilling. Also, dyeing with a group of people is so much fun. I had two projects that I wanted to work on. 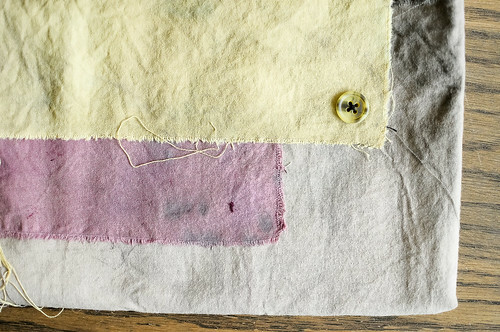 The first was a very simple natural dyed quilt. 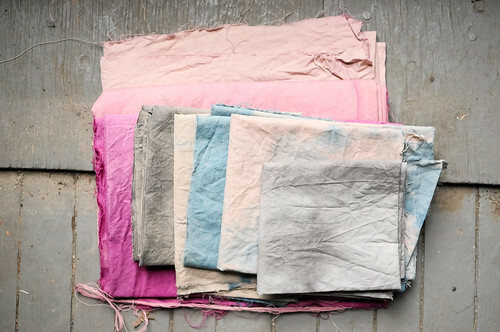 I took some organic cotton brushed sheeting and randomly cut it into pieces that I dyed and over-dyed into various colours. My plan is to simply stitch all the pieces back together to create a front and back of a quilt. I’ve kept pretty good notes on what each piece was dyed in, so the quilt will be a bit of a map of all the dyeing I did in class. My second project was to dye a piece of silk for a dress. I’ve been pinning all kinds of inspirational dyeing images on Pinterest. In particular, I really loved this super dark, inky dress and wanted to try to replicate that depth of colour. A lot of the natural dye colours end up being very soft and muted, so I thought I would have to do some over-dyeing to build up that kind of colour. By accident, I ended up creating a very dark logwood bath using an older bundle of logwood chips that had been previously used and I had kept for the past few months in a plastic bag. I think something about the wood staying wet for so long, released a lot of colour into the bath and we got a purple that was almost black. 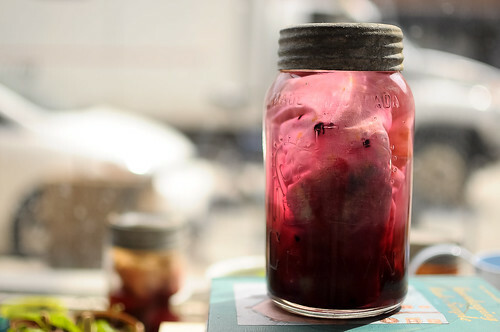 There are so many great surprises in natural dyeing. I twisted up and tied my bundle of silk and cooked it carefully in the bath for a while. I’m so happy with how it turned out in the end and love the shibori pattern it created. Arounna made all kinds of lovely scarves and bags from her class work. 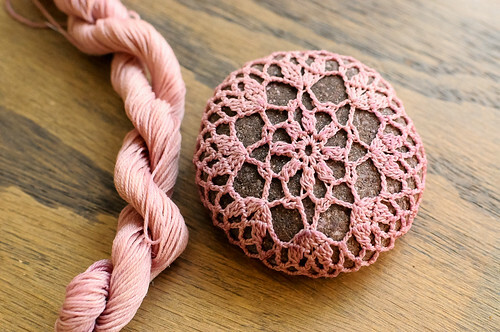 Margie had all kinds of shibori, yarn and even her beautiful crochet stones dipped into the pots. Carolanne was working on an indigo shibori dyed piece of washi paper that she is hand quilting. Brian was working on creating fabric samples to make quilt blocks from. Susan did some fun solar dyeing, yarn and shibori experiments. Even Julie bundled up some fabric during class for solar dyeing. We had such a great time in class together and I think there will have to be a little dye party reunion during the summer. I want to do more dyeing! i am calling 2011 the year of dyeing naturally in my home. I can’t wait for the class summer reunion. Love your silk fabric and I can’t wait to see you sew it into a dress. 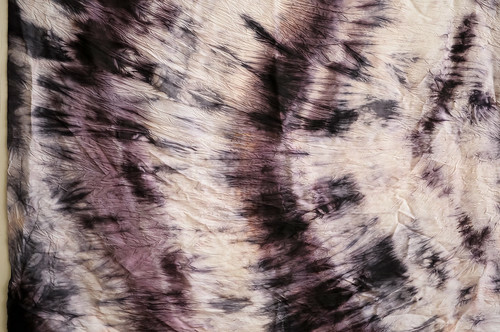 i’m so excited to see how the shibori dress turns out, too. the serpentine patterning on it is really great. this looks so amazing! oh most of all your natural dying class just makes me burn with jealousy. I would love to be able to experiment, I long to make a bolder dyed quilt than the one I made before. your silk is gorgeous! arounna & margie – the indigo vat looks like it finally might be ready soon, so we’ll have to make a plan for a get together. the ADN course was great, such a bunch of wonderful and creative people, much inspiration. the indigo vat is alive and well? don’t forget me!